It is not for use within the U.K. 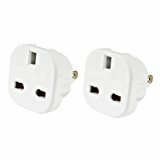 This product is for use only outside the U.K.
Travel Adapter Converts UK Plugs Plug to USA Plug – Works in American Samoa, Anguilla, Antigua and Barbuda, Aruba, Bahamas, Barbados, Belize, Bermuda, Bolivia, British Virgin Islands, Cambodia, Canada, Cayman Islands, China, Colombia, Costa Rica, Cuba, Dominican Republic, Ecuador, El Salvador, Guam, Guatemala, Guyana, Haiti, Honduras, Jamaica, Japan, Korea, Lebanon, Liberia, Malaysia, Maldives, Mexico, Micronesia, Montserrat, Netherlands Antilles, Nicaragua, Niger, Palau, Panama, Peru, Philippines, Puerto Rico, Saint Kitts and Nevis, Saint Vincent and the Grenadines, Taiwan, Thailand, Trinidad and Tobago, Turks and Caicos Islands, United States of America, United States Virgin Islands, Venezuela, Vietnam and Yemen. Also works in American Samoa, Argentina, Australia, China, Cook Islands, Fiji, Kiribati, Nauru, New Zealand, Papua New Guinea, SaintVincent and the Grenadines, Samoa, Solomon Islands, Tajikistan, Timor-Leste, Tonga, Tuvalu, Uruguay, Uzbekistan, Vanuatu. Everything You Need To Know Before Traveling!